Aren’t the models cute? Did you recognize the book Julio is holding? Why, it’s Thermal Physics by Kittel and Kroemer, of course. Ariel had brought a drum and a guitar, and there was music and dancing. Very entertaining for the elderly beach strollers, judging by the staring that was going on. At this point, a park ranger truck pulled up and asked us whether we had a permit to shoot. I confess that I have committed a sin of omission. I was not the one who said it was a student project, but I did not correct the person who said that. I looked it up later, because I wanted to retroactively pay the permit fee. It turns out that there’s no charge; the city just wants to make sure that a commercial photo shoot has insurance. We did! We do! Sorry, Mr. Ranger! I still feel icky about this. Girl Scout through and through. First stop: an overlook at Natural Bridges, on Santa Cruz’s Westside. It’s a beautiful, fresh morning with a small ocean breeze. Feel it? Hear those birds and the waves crashing? Smell the salt air? Mmmm, summer in Santa Cruz. Ariel and Warren set up the lights. The camera was wirelessly connected to them, so the theory was that the lights would fire as the photo was taken. Theory–it took some fiddling to make it work, and it mostly worked. But they had to fiddle all day! Heather is demonstrating that girls DO like math. Remember this for later when there is a Misunderstanding of Comical Proportions. But someone’s missing from the photo above: Kim, the makeup and hair person, was standing by with her rolling suitcase of tools. I’m just learning to drive this thing (the blog), and you can see I have a new toy today: links! Shall I stop with four in this entry? Who’s been to Natural Bridges? The name is for the rock formations at the water’s edge, but the park also includes a large eucalyptus grove where the monarchs migrate in the late fall. Entomologists, do I have that timing right? What if the shirts don’t fit? Kim Guiley (www.blendingbeautiful.com) did hair and makeup and had the early call: she showed up at the studio at 5:45. Brave girl! Kim preps Vicki’s makeup while Julio and Sixto chat in the studio. By the time I arrived at 7:30 a.m., Kim was on the last bits of dabbing and fluffing. I met Vicki and Julio for the first time, and reintroduced myself to Heather and Sixto. I showed them an ad I’d seen recently that had models pouting and posing in self-conscious ways–not the look I was going for. I also had some examples of models who looked like they were having fun, and posing in a friendly, relaxed way. In fact, each model fit into the smaller size I’d printed for them. If you’ve got it, flaunt it! 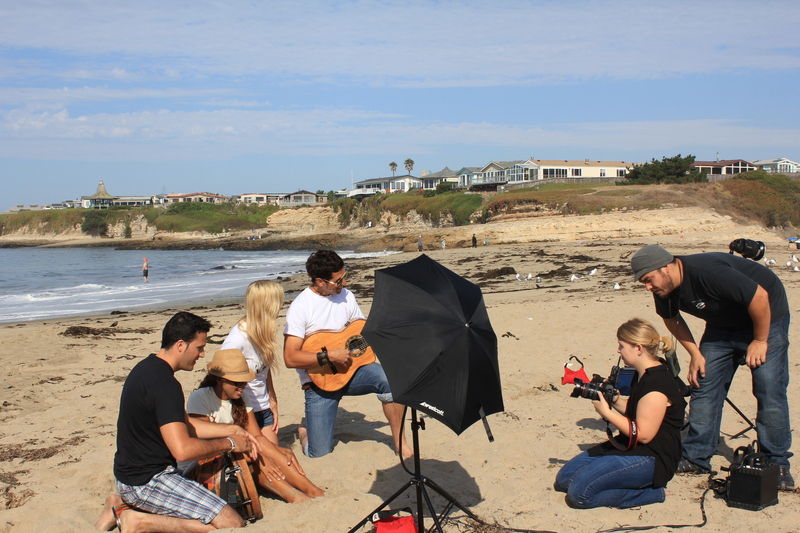 Very soon after that, we piled into two cars and went to a nearby beach for our first group shots. It was fun to see Ariel and Warren get to work on the lighting and the wireless coordination of the camera and the lights, and to see the models spring into action, being all modely and cute and smiley. I took lots of behind-the-scenes photos and even some videos so you can see what the shoot looked like. Have you ever done a photo shoot? How did it go? Tell me about it! Don’t ask me why I didn’t just ask Ariel what I should do to prep. Instead, I imagined what we’d need, and then I’d email her with each question as I thought of it: what will people eat, and when? 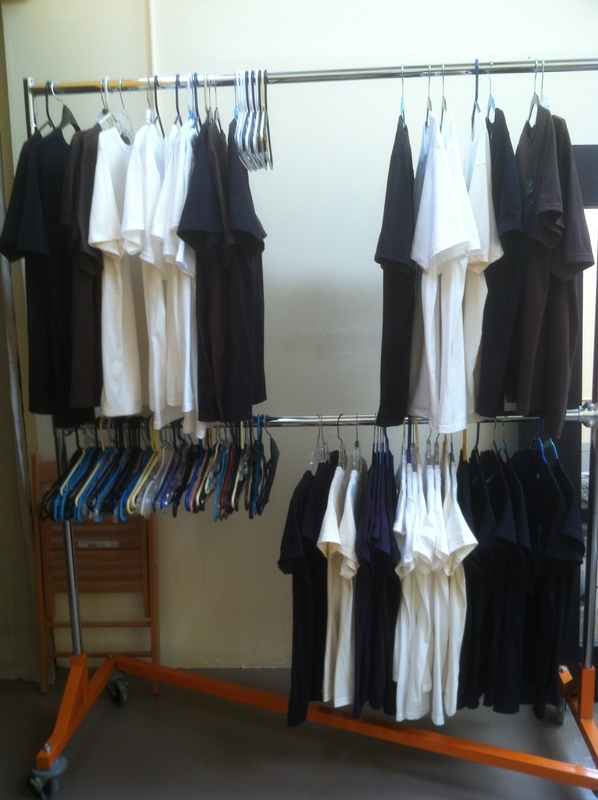 How can I prep the shirts and get them to the shoot without wrinkling them? What if the shirts don’t fit right? What if someone doesn’t show up? Can we get the models’ weight and chest measurements? Following Ariel’s suggestions, I ordered a sandwich tray and vegetables with dip, and planned to bring fruit, pretzels, and water the day of the shoot. I gathered as much info as I could about the models, and made a guess on sizes. 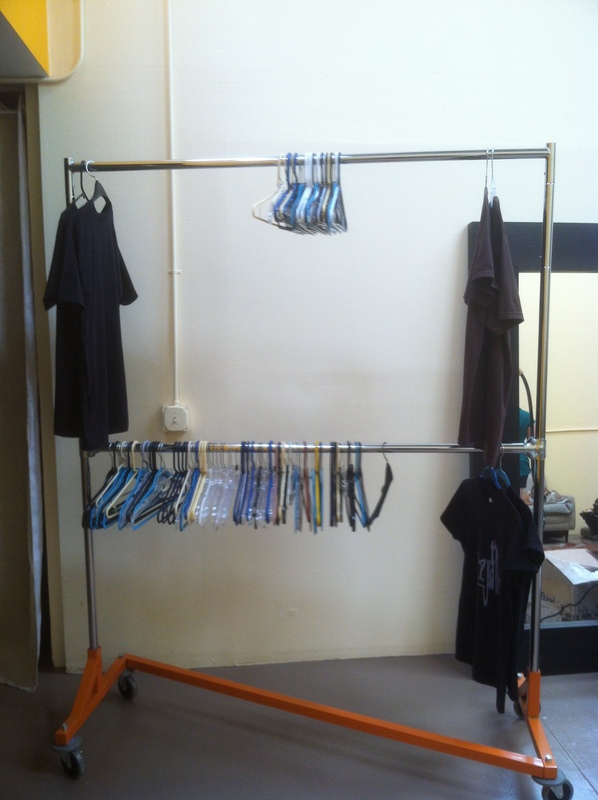 We got our rolling rack out of storage, and I assembled it in Ariel’s studio. We also had a clothing steamer that we’d never used, but it turned out to be simple to set it up, too. We had plenty of hangers that we’d accumulated while we were learning to print. Over a couple of days, I steamed over 80 shirts. working a few hours per day. Don’t these photos look just like a stop-motion movie? No? Darn. 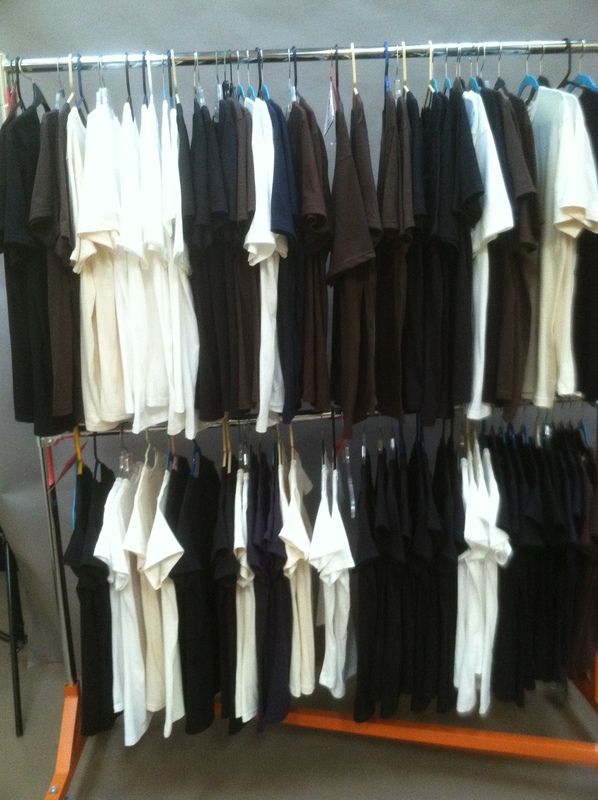 These are all the printed shirts. Then I realized we also needed to photograph blanks. We’re thinking we might use the blanks to spoof product shots when we have new shirts but won’t have another photo shoot for awhile. Back to the steamer for more! I had a master list showing each model and which shirts they’d be wearing. I used that to put each person’s shirts together with a label so they could keep track of them. Ha–we’ll see how well that went when I finish this story. Our direct-to-garment printing process means I needed to order shirts specifically for each model, and they’d have to be printed in between choosing the models and the photo shoot. It was agonizing trying to get more details about the models’ sizes–I had bits and pieces of information, but not the same info on each person, and not enough to really know what sizes to order. I ended up ordering two sizes for each model. That was over 60 shirts! We couldn’t get them printed in time, so we moved the photo shoot out a month. Uh oh! When we rescheduled, we found out that Adrian was leaving to study abroad and wouldn’t be available for the shoot. He had such a nice personality in the few minutes we saw him, and a beautiful smile, so we were sorry that he wouldn’t be able to work with us. The next guy we picked wasn’t available. The guy after that wasn’t available. We couldn’t pick anyone too short, because Sixto is 6′ 4″ and we didn’t want a shorter guy to look out of balance. So now we’re constrained by the timing of the photo shoot, by the model’s height, and by whether he’ll fit into the shirts that have already been printed. No pressure! Finally, we found Julio, who looked great. And he was available. Ariel has already put in hours on this project, and all we’ve done is the casting. She’s a pro. So here they are, our beautiful models! They were asked to do three poses. In the first, they held a paper number that identified them and gave us a big smile. In the second, Ariel asked them to do something quirky. Sixto, second from the right, repeated “Quirky?” in his Spanish accent (ladies, you will love it–I’m going to ask the models if they’ll answer some questions on my iPhone so, if he agrees, you can all hear it), and Ariel clarified for him. Adrian, on the far right, brought glasses to the shoot as a prop. We loved that! In the third photo, they could do whatever they wanted. 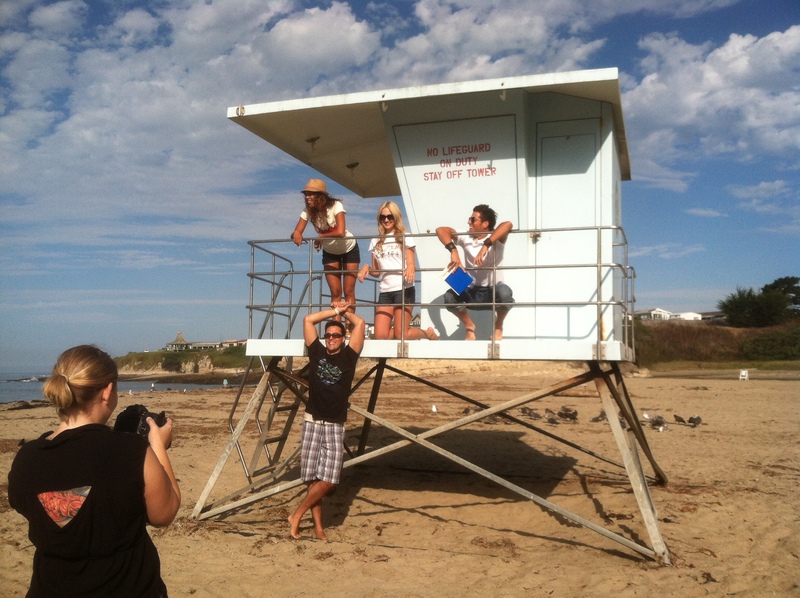 There was always a moment of hesitation before they (sing it with me) struck a pose. Oh, can you tell which pose this is? This is everyone’s quirky pose. From left to right, meet Vicki, Heather, Sixto, and Adrian. You four have gorgeous smiles! The only one I didn’t see at the casting call is Vicki, so I’ll be meeting her for the first time at the photo shoot. Can’t wait!